A very easy and tasty recipe! 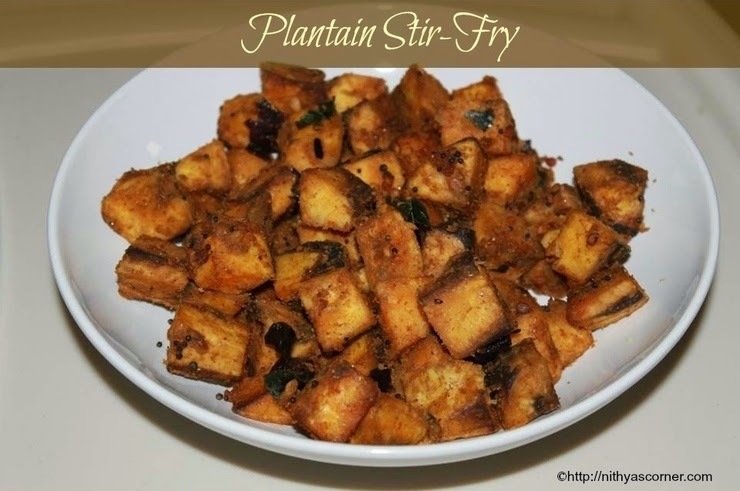 Plantain Poriyal is one of my favorite recipes. A very common poriyal in TamilNadu. I usually like to eat it along with sambar, rasam, and curd rice. I do not have to saute much. Just 5 minutes is enough to make this tasty and spicy poriyal. 1. Remove the skin of plantain. Cut the plantain into small pieces. Boil the plantain pieces in water by adding salt and turmeric powder. 2. Cook till the vegetable becomes soft. Drain the excess water. In a pan, heat oil and add mustard seeds. When mustard seeds pop out, add Urad dal, curry leaves, and red chillies. Fry until urad dal turns golden brown. 3. Then, add plaintain pieces and sambar powder. Fry well. Add coconut gratings and little salt. Now, Plantain Poriyal is ready!!! This entry was posted in With Coconut and tagged Basil Rice, Curry Leaves, Mustard seeds, Plantain, Plantain Poriyal on November 22, 2014 by vikashbhardwaz.